The Pittsburgh Penguins have played a ridiculous amount of hockey these past two years. After going all the way to a championship in 2016, they barely had enough time to eat French fries out of the Cup before their stars were whisked away for the World Cup of Hockey. Between two four-round postseasons, the World Cup, and a full regular season, you’re looking at one exhausted, battered hockey team. They began the playoffs without their starting goaltender. They have now played four rounds without their top defender. 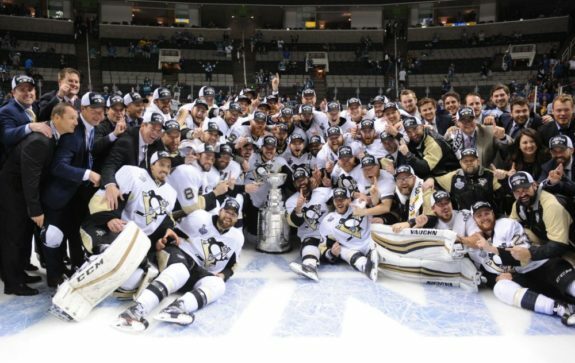 And yet, somehow, someway, they are one win away from keeping the Stanley Cup in Pittsburgh. The Penguins owe this run to several key players, but none more than the faces of their franchise. 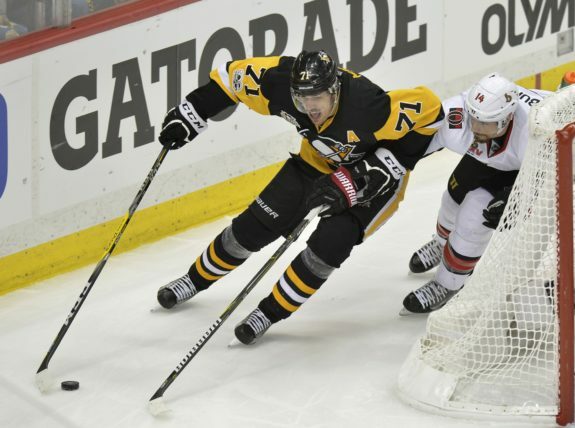 Sidney Crosby and Evgeni Malkin have been playing out of their minds, and if the Penguins manage to win on Sunday, one of the two of them should be lifting the Conn Smythe Trophy as playoff MVP. There are other names at the top of the Conn Smythe nomination list that are surprising. One of these surprises was Marc-Andre Fleury, who wasn’t even supposed to start in the first playoff game. Called in last minute after starter Matt Murray injured himself in practice, Fleury proved to be phenomenal. He single-handedly dragged the team, kicking and screaming, through their second round against the Washington Capitals. Without him, the Penguins would never have made it to the Conference Final. His name would be at the top of MVP contention had he not been pulled halfway through the series against the Ottawa Senators. Murray, once healthy, regained the net, taking Fleury’s starting gig and most likely his chances of claiming the Conn Smythe. Possible offensive MVPs are Jake Guentzel and Phil Kessel. Guentzel’s historic 13-goal postseason performance has smashed several records by becoming the most playoff goals ever scored by an American rookie. He has also recorded five game-winners, which is the most deciding-goals in the League. Meanwhile, Kessel has 23 points, the third most in the League, and maintains the highest Corsi For percentage (CF%) on the team with 51.8%. 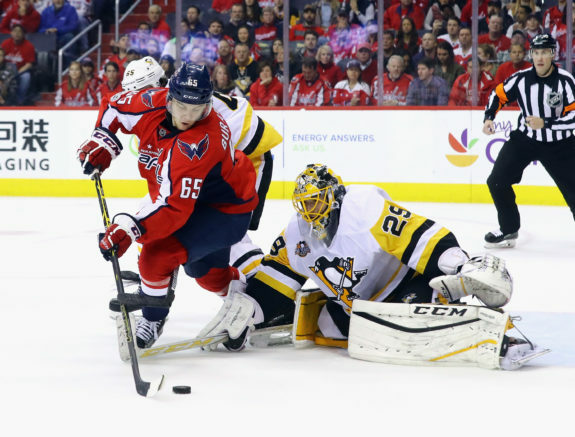 These players have all been key parts of the Penguins’ success, and have done their best to cover up the team’s nagging defensive flaws with their high production levels and shut-down goaltending. But they can’t compare with the team’s two stars. These playoffs have been dictated in large part by the familiar names of Crosby and Malkin. Malkin has 28 points in 24 games this postseason. Crosby has 27 points in 23 games. With each averaging 1.17 points per game, Crosby and Malkin are two of only six players to have a production rate of over one point per game these playoffs, and they’re the only two to have made it to the last round while maintaining that rate. The other four players who tallied over a point per game were eliminated much earlier in the playoffs (Sean Monahan and Alexander Radulov each played only in the first round; Leon Draisaitl said goodbye in the second, while Ryan Getzlaf finished his final handshake line in the third). The two have been the most consistent performers throughout the playoffs; individually, crucial parts of why the Penguins’ offense is hard to shut down. Sure, you can produce a defensive matchup for Crosby’s line, but can you cobble together a second one to match Malkin’s? The two are so close in terms of production —Malkin leads Crosby by only one point— that it makes choosing one as the MVP feel like splitting hairs. But if you want to choose the most consistent, reliable performer on the team, the answer has to be Crosby. Remember when it was unknown whether or not Crosby would be healthy enough to play through the rest of this postseason? It feels like years, but it’s been just two series since the cross-check to the face that left Crosby concussed and off the roster. The team was unsure when he would return, if he was to return at all. The Penguins won their next game without their captain, but it was a messy, desperate affair, ending with a third period that felt like a twenty-minute penalty kill. They scraped by, somehow. But it is doubtful that they could have finished the series victorious had Crosby not returned. 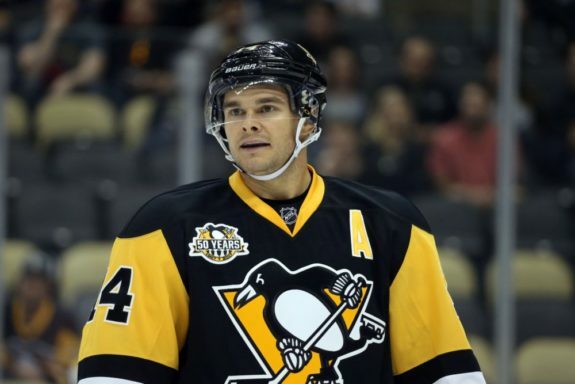 So many of the heroes of this Penguins’ playoffs run— record-breaking rookie Guentzel, double overtime series-winning goal-scorer Chris Kunitz— owe their success in part to Crosby. Crosby has been making the players around him better. Corsi For Percentage (CF%) measures a player’s impact on the team’s possession; if the percentage is over 50, the team has more shots for than against when the player is on the ice. Crosby has a huge impact on other players’ CF%’s, as shown in the table below. The average postseason CF% for regular players on the team, with and without Crosby on the ice, is displayed. Malkin’s numbers are shown for comparison. It’s hard to get statistics for possession in hockey, but CF% is as close as it comes. The general rule of thumb is that, if you’re taking more shots than you’re allowing shots against, you’re controlling play. Crosby has an overall positive impact on the team’s control of play. Malkin has not had the same positive effect, likely due to the fact that he has committed the most turnovers on the team this postseason. Malkin has tallied 17 takeaways this postseason, but also committed 29 giveaways; Crosby maintains a better ratio with 15 takeaways to 13 giveaways. Crosby has an overall positive effect on his team’s control of the game through his dominant puck possession. In a playoff run where the Penguins have often been outshot and outplayed for long stretches of time, this has been crucial. 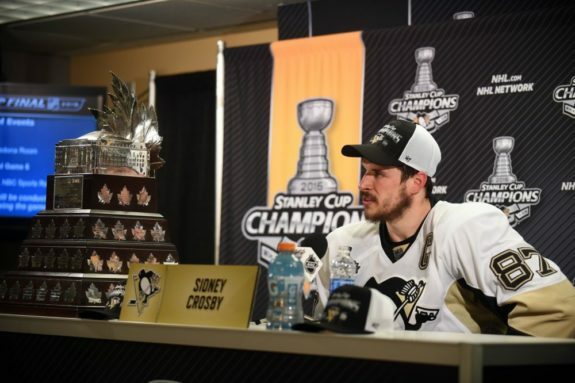 Halfway through the second round, it was unclear whether we’d even be seeing Crosby again. But this has been one of the best playoff performances of Crosby’s career, and even a concussion couldn’t slow it down. He has been indomitable. His possession ratio is the best on the team. His current total of 27 points dwarfs that of his previous Conn Smythe-winning performance (19 points in 2016). He’s playing some of the best hockey of his career, which means he’s playing some of the best hockey in the League. Crosby and Malkin have both been performing at an elite level, but Crosby has been the most important player these playoffs. Crosby is living up to the hype, and if his team manages to win their second Cup in two years, he deserves the Conn Smythe. He’s more than earned it.